If you’ve tried Google Cardboard and are over the age of 30, you’ve probably noticed some parallels to those old View-Master stereoscopes. Now, Mattel is embracing the comparison with its own virtual reality headset. Starting this fall, Mattel will sell a virtual reality version of View-Master using the same software as Google Cardboard. Instead of sticking slide reels into the plastic frame, you’ll plop in an Android phone. Instead of seeing static images, you’ll use apps to explore virtual worlds. Mattel isn’t totally abandoning the concept of reels. They’re just being re-purposed as augmented reality portals. Throw a few reels on the table, and they’ll project miniature worlds when viewed through the phone’s camera. Flicking the View-Master’s levers while looking at a reel will then take you straight into the scene, so you can get a close-up on things like the solar system, the dinosaur age, and the sights of San Francisco. Mattel says it will try to create new reels using some of its old View-Master footage, potentially offering scenes from Star Wars, Star Trek, and old music concerts. 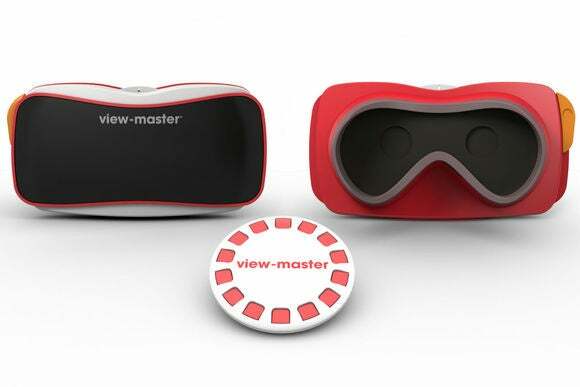 The View-Master will cost $30, and will include one sample reel, with additional reel three-packs selling for $15 each. If you already have Google Cardboard, it sounds like you’ll also be able to use the reels without buying the View-Master itself. Why this matters: Although Google Cardboard started as an experiment, Google is slowly turning it into a business, with 500,000 units shipped and an SDK to help developers write new apps. Still, it’s unclear whether Cardboard will graduate from neat tech demo into something more substantial. In the meantime, marketing it as a children’s toy is a fine way to get Cardboard in front of more faces, and the partnership with View-Master—whose hardware has gone largely unchanged since its introduction in the late 1930s—is about as sensible as it gets.